This evening I have had to put a bit of extra thought into our dinner. Our weekly shopping isn't delivered until tomorrow and I am pleased to say, that for once, I have used up what I bought last week. But that did leave me a bit stuck as to what to cook for tea. I took some mince beef out of the freezer this morning and hoped for the best! We had no potatoes or rice. We had pasta, but I did pasta last night, so wasn't going to cook it again tonight. After looking in the cupboard, for what seemed like an eternity, I had an idea! 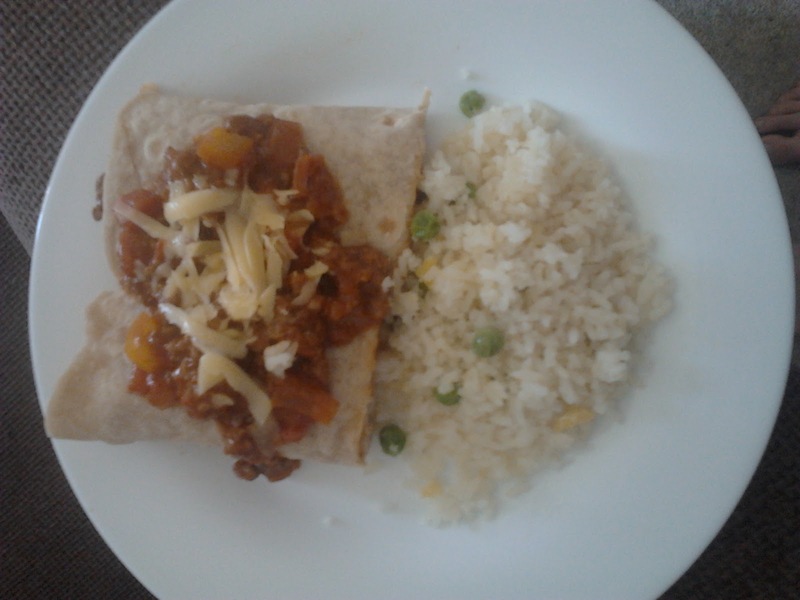 Mexican chilli beef wraps with a side portion of rice!!! I cooked the chilli and made some tortilla dough. I mixed it up and gave it a quick knead. Once the dough had come together I separated the dough into about 6 pieces and rolled them out. They only needed a couple of minutes on each side in a hot frying pan and they were done. I feel so much more pride and satisfaction in a meal that I have really had to think about. This certainly was a delicious meal made from the odd bits that were left in my cupboard and fridge mixed with some of my cupboard essentials and some imagination. I am sure that this will be a meal that I will be cooking again!